We have over 35 years experience of printing orienteering maps, including maps for JK weekends, British Championships, Scottish 6 Days Events and the Original Mountain Marathon.We produce very competitively priced maps for events of all sizes and permanent courses. We can produce offset litho printed maps up to RA2 in size (430mm x 610mm) and digitally printed maps up to RA3 in size (305mm x 430mm). All maps can be printed on either waterproof or ordinary paper. Maps can be laminated or sealed in polythene bags if required. This is usually the cheaper alternative for maps, particularly where an event has quite small numbers of competitors on each course. The unit cost is constant with digital printing so the cost of 500 maps is five times the cost of 100 maps. Our digital printer is designed for professional printers and can produce higher quality maps than can be produced by normal colour laser printers available to the public. Digital printers produce maps out of cyan, magenta, yellow and black dots. These dots are mixed in such a way that any colour can be produced. Therefore logos or adverts can be printed on our digital printer even if they are not made up of the five IOF spot colours. Also the number of different courses you want printing on the map will not affect the price. Different digital printers reproduce different shades of colour from the same computer file. Our printer produces a close match to IOF colours, using the default OCAD colour table. If you are concerned about the accuracy of the colour shades, please contact us. We can suggest a variety of adjustments depending on the type of terrain covered by the map. Offset litho printing of orienteering maps is normally done on a “spot colour” basis. This means that printing plates for each of the five IOF specified colours (Black, Blue, Brown, Green and Yellow) is produced and each of these colours are individually printed on the paper. Once the blank map has been printed, each course is overprinted in purple. This means a printing plate has to be produced for each course. This method means the cost of printing the first map is quite costly, in excess of £150. However, extra maps are much cheaper as the printing machine can operate at over 3,000 sheets per hour. This spot colour method of litho printing produces a crisper image and more accurate colours which are transparent. Because extra maps do not cost much, it can be cheaper to use this method for large events or for permanent courses where there are only one or two different overprints of controls. 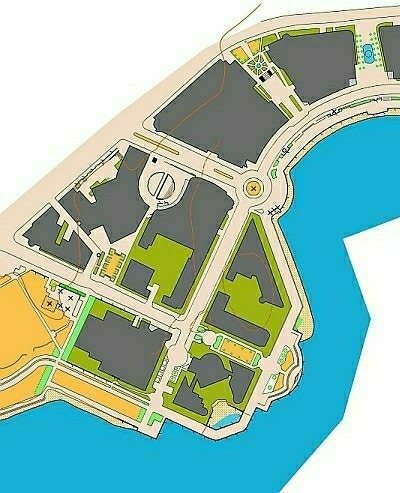 At present the governing body, British Orienteering, requires maps for category A orienteering events to be produced by spot colour litho printing. It is possible to litho print using cyan, magenta, yellow and black dots and the result is usually better than from digital printing. This may be the best choice for permanent course maps where there is only one overprint of control sites. Because at least five printing plates have to be produced for each base map, it is not normally economic to have more than two different layouts or scales of map. The largest events usually require two scales of map, in which case costs can be controlled by ensuring that only one layout of map is needed for each scale. Make sure that there is room on the map layout for the largest description sheet you want to print on the map. Because only the five IOF colours are usually printed, club logos and adverts can only be printed in these colours. Additional colours can be printed, but this will add to the cost. Maps for British Orienteering Championships events require at least two extra colours to produce the standard British Orienteering Championships map layout. For more information about map printing, please contact us.